"Pictures of God" is a devotional book that uses words to draw 16 portraits of God. 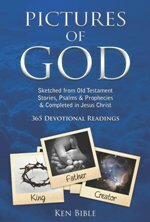 These portraits are drawn from the breadth of the Old Testament: "God Our Creator," "God Our Father," "God Our Shepherd," and 13 more. Each portrait is painted with one or more Bible stories, Psalms, and prophecies. Each is then beautifully completed in Jesus Christ. These "Pictures of God" are enriched by links to 120 new, original hymns scattered throughout. All are available free at LNWhymns.com. "Pictures of God" helps the reader understand God in deeper ways and explore His Word more broadly. Look at Jesus, and see the beautiful life that can be yours by simple faith. Jesus was constantly sufficient for all the demands facing Him. He was busy but never stretched thin, threatened but never afraid, pressured from the outside but always at peace. Wouldn’t you love to live that way? Remember that Jesus was as human as you or me. His uniqueness was His relationship with His Father. He was who He was by faith in His Father, and He eagerly shared that relationship with His followers. That is the central truth behind One with Our Father. 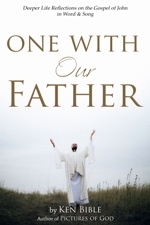 It includes 85 devotional readings based on the Gospel of John. Each reading is accompanied by a scripture reference, a link to a companion hymn, and a brief, thought-provoking response. Jesus is a living promise of what life can be. Knowing and trusting the Father can be our joy, our constant strength, our present birthright, and our eternal destiny.